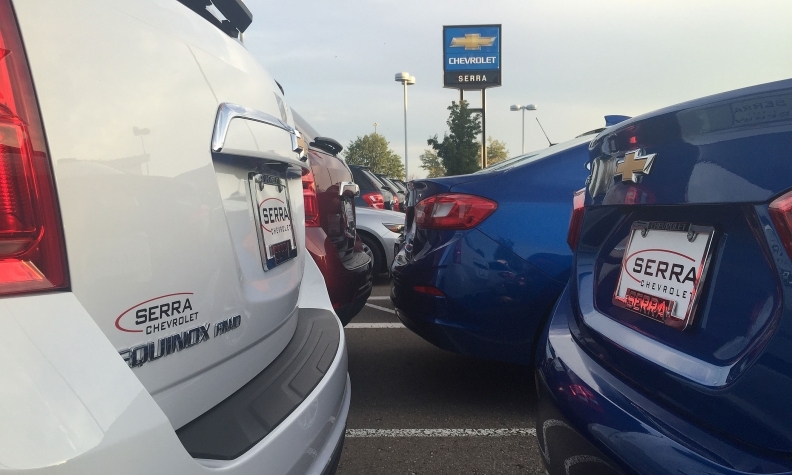 GM said the the Chevrolet Cruze, Malibu, Trax, Silverado, Colorado, Spark, Tahoe and Suburban all achieved higher retail share in their segments. DETROIT -- General Motors’ sales in the U.S. fell for a fifth consecutive month amid “very tight dealer inventories,” but its average transaction price climbed to a record, and Cadillac sales rose for the third month in a row. Overall August sales were down 5.2 percent, and retail sales fell 5.4 percent, GM said, but its retail market share rose for the seventh time in eight months, even though its total sales for the year are down 4.2 percent. It was only the second month this year in which GM’s retail sales declined, the first being May. Retail sales of the recently redesigned Chevrolet Cruze rose 18 percent, and overall Cruze sales jumped 52 percent in August to 22,342 units. August was the best month for the Cruze since last summer; the model had been down 33 percent this year through July. GM said the Cruze, Malibu, Trax, Silverado, Colorado, Spark, Tahoe and Suburban all achieved higher retail share in their segments. GM said its average transaction price rose $2,500 from a year ago, to $36,730. Kelley Blue Book calculated GM’s year-over-year transaction-price increase to be $1,890, or 4.9 percent, and said that was the largest gain among all major automakers. Cadillac was the only GM brand to post a year-over-year gain in overall volume, up 3.9 percent. Sales declined 2.7 percent for Buick, 3.9 percent for Chevy and 14 percent for GMC. The Cadillac CT6 had its best month since launch, totaling 1,242 units, and sales of the XTS sedan jumped 48 percent. Combined sales of the new XT5 crossover and the SRX it replaces were 15 percent lower than a year ago. Despite the August gain, Cadillac’s sales are down 6.2 percent year to date, the biggest decline among GM’s four brands. Sales fell 4.7 percent last month for the Chevy Silverado and 18 percent for the GMC Sierra, but their combined total surpassed the Ford F-series for the second month in a row. (F-series sales declined 6.1 percent in August.) GM said the crew-cab Silverado had its best August ever. In contrast to those declines, sales of GM’s midsize pickups surged. The company posted gains of 30 percent for the Chevy Colorado and 39 percent for the GMC Canyon. Sales fell 39 percent for the Chevy Equinox and 35 percent for the GMC Terrain, a total decline of 13,171 units for the two compact crossovers that are due to be redesigned next year. They alone accounted for 94 percent of GM’s overall volume decrease.